Beginning Sunday, January 4th at 8 PM ET/ 5 PM PT, it’s a special non-stop marathon of every episode of The Dinner Party Show featuring world-famous author (and “premiere Party Person”) Anne Rice. Relive her on-stage appearance before a live audience at Bent Con as well as the exclusive announcement of Lestat’s much anticipated return, and all the other exciting, hilarious and provocative highlights from Anne’s many appearances on The Dinner Party Show, all of which are part of The AnneRiceAThon! You can listen via the player at TheDinnerPartyShow.com or with our free mobile apps for Android and Apple devices, also available through TheDinnerPartyShow.com. 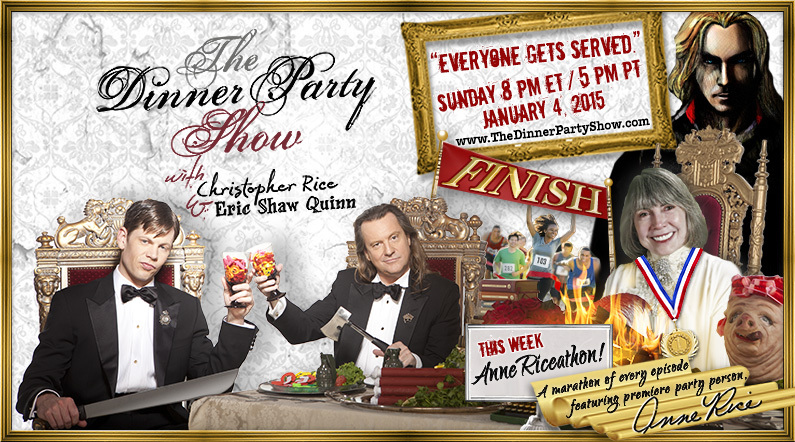 The marathon runs continiously until Sunday, January 11th 8 PM ET/ 5 PM PT when Christopher and Eric will return with an all new LiveCast of The Dinner Party Show.